Easily add a threaded Achla bird bath to your existing 1" outer diameter pole using this Achla Black Pole Mounted Bird Bath Bracket. This durable, wrought iron unit attaches onto existing 1" outer diameter poles with ease, thanks to its integrated clamp and wing nuts. The significant arm extends 10.5" outward, culminating in a gentle curve, and a downward arched scroll beneath the clamp adds style. Attach a threaded Achla bird bath (not included) to the screw at the end of this bracket, providing your feathered friends a fun new bathing spot. The black, powder coated finish of this arm prevents it from rusting, and easily meshes with the rest of the birding pole kit. 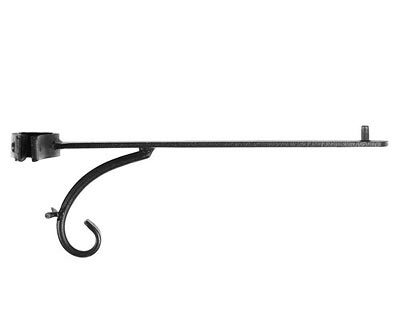 Display a threaded bird bath from a pole using this Black Pole Mounted Bird Bath Bracket.